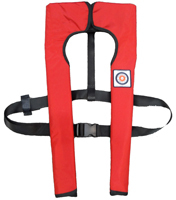 ROARING FORTIES™ M150 series Inflatable PFD Type 1 is light weight, comfortable and easy to don. It is now Dual Approved to AS4758 and ISO12402-3 (Level 150 PFD). With an actual buoyancy in excess of 186 Newtons. The M150 series Inflatable PFD Type 1 has similar basic design to the popular SMA1060 series and the inflatable life preservers we manufacture for the Australian Army (light Infantry), Australian S.A.S. and Australian Commandos.